Houses that have been on the market a while will likely try to price drop before or during the holidays to get some action on the home and get it sold before the end of the year. With fewer buyers in the market, sellers are trying everything they can to get more traffic to their property. In the market for a new home? Many builders are anxious to get their spec homes (completed new homes) off the books for the current year, to clear the way for upcoming construction projects. This can mean close-out pricing and added incentives, such as basement completion or add-on allowances, to get those homes sold. December is a great time to buy a spec home! During the hot selling season - usually in the spring, possibly longer - buyers can often find themselves up against several other buyers vying for a home - especially the really great homes in great locations. This can make the home buying process frustrating. Potential new homeowners get their hopes up and then face defeat and frustration as they are beat out in a bidding war. And that happens over and over again. But during the holidays, there are definitely not as many buyers in the market. This can mean much less frustration for buyers with the home shopping process AND less need for bidding wars and over-inflated offers to beat the competition - YEAH! Win-Win! Oh, and you can get some tax benefits too! 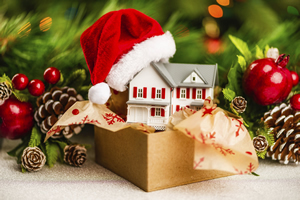 Purchasing a home before December 31 can help you come tax time - you can deduct property taxes, mortgage interest, origination points on your loan, and interest costs. Every little bit helps when April 15 rolls around. Check with your preferred tax professional to explore your tax savings options. It’s a slow time for mortgage bankers too, so loan officers may be offering special incentives and possibly waiving or reducing origination fees. With less transactions happening during the holidays, underwriting may be able to provide a quicker turnaround time than possible during the busy season. Before looking at homes, make an appointment with a lender to chat about your budget and finances, as well as any perks they are offering for buyers during the holiday season. Let’s find a place to hang some mistletoe! So what do you say? Want to get a new home from Santa? I may not be an elf, but I can sure help you find a wonderful home and will work hard to get you a fabulous deal. Give me a call to help you find that perfect picture window in the perfect house for your family Christmas tree.